Linly (right) visits with a woman from one of their communities who has been very successful with pig raising. In short, South-South cooperation happens when developing countries look to one another for meaningful answers instead of turning to the West for Western answers. This year, FH Cambodia demonstrated real leadership in this area when they reached out to a church in the Philippines for expertise, advice, and resources on developing their own AWANA** kids’ club program. Linly Gula, FH Cambodia Country Director, reports. In March 2016 I took a trip to Canada to visit our FH partners. One meeting was with Jon Imbeau, the AWANA Canada National Director. When I mentioned wanting more support in launching the AWANA program in some of our villages, he told me about Kraig Akut, the AWANA trainer based in Southern Philippines. Through this connection, FH Cambodia formed a relationship with Soli Deo Gloria Church (SDG) in Davao, Philippines. My friend’s sister actually attends that church and is very active in leading their AWANA ministry. A partnership evolved organically from there as the SDG team enthusiastically shared their ministry experiences with us. Networking and connecting with groups and individuals who have solid, hands-on experience in a specific initiative, like AWANA, is integral to our learning process. Cambodians learn more by doing than reading. Storytelling and sharing practical experiences is very important. The workshops led by the Filipino team modeled the practical steps of implementation and physically involved the pastors and volunteers in each demonstration. Kids from local churches joined the adult trainees in playing AWANA games while the Filipino instructors coached the participants and gave real-time feedback. Fun game demonstrations with local kids. Through our new partnership with Soli Deo Gloria, we continue to learn creative ways to engage local church leaders. By sharing real stories of children, families, and churches being transformed, the Filipino team faithfully encourages our local leaders with the great possibilities of ministry in Cambodia. They are also very honest. They share their successes, as well as the challenges of working among children. So much potential can be uncovered if more connections like this can be made. The mentoring components from both AWANA Cambodia and Soli Deo Gloria are complementary - the material translated in Khmer guides the flow of the process and the practical experiences of the SDG team show us what it could really look like. AWANA training with Filipino partners. With the help of our new friends in the Philippines, we continue working to contextualize the AWANA approach to fit into the specific culture and gospel readiness of our northern Cambodian communities. 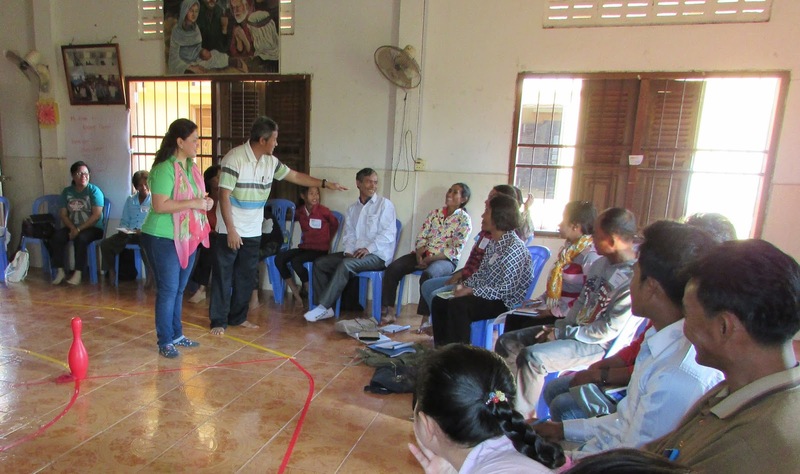 This week (March 2017) FH engaged 30 participants in AWANA leaders’ training; some are former Khmer Rouge soldiers turned pastors—we are humbled by this open door to walk with these leaders even closer! We hope to roll out AWANA among our 68 partnered villages and 22 partnered churches. With this initiative we will be touching the lives of approximately 11,000 children. Visit here to support AWANA programs in FH communities! **AWANA is an international, biblically based children’s club.